Mini is an iconic British car brand which has been launched in India in January 2012 at the Auto Expo 2012 with the lineup of 4 cars – Mini Cooper, Mini Cooper S, Mini Cooper Convertible and Mini Countryman crossover. Mini has recently opened its first two Exclusive Mini brand showrooms in Mumbai in April 2012 and New Delhi Mini Dealership In June 2012. We attended the Mini launch in India during the Auto Expo and at Delhi showroom opening. 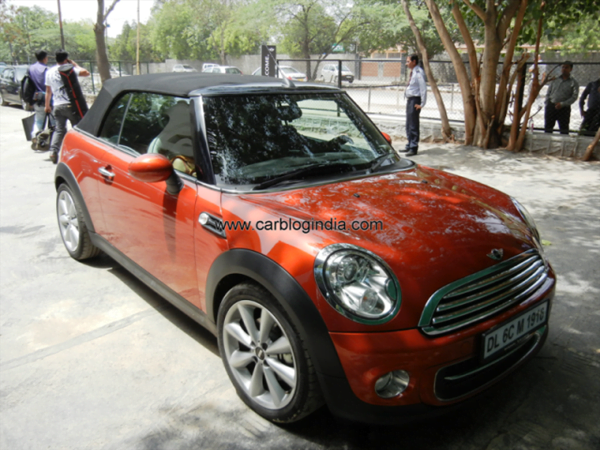 We got a chance to take Mini Cooper convertible for a spin on Delhi roads. In this article, I share my experience of driving an iconic car in its modern avatar, the Mini Cooper Convertible automatic test drive review. The car which I drove was a 2 door 4 seater convertible with a 4 cylinder 1.6 Litre petrol engine with a peak power of 122 BHP @ 6000 RPM and torque of 160 Nm @ 4250. The engine is coupled to an automatic transmission gearbox which comes with manual mode for sporty driving experience. First thing which you will notice when you are still outside a Mini is its attractive design, its classic design elements fused with modern elements, sporty character and classy looks with lots of chrome touches here and there. The sporty alloys, low ride height, prominent wheel-arches, soft top (electronically retractable in 15 seconds), chrome treatment on the front, large round headlamps with a classic exterior and modern technology of HID projectors, the rounded styling all over and sporty two door styling makes it an eye candy. Everything on the inside of a Mini Cooper convertible is very classy and retro in looks yet very modern in functionality. There are stereo mounted controls, chrome ring on the 3 spoke rounded steering wheel, almost everything is round in shape right from the remote for keyless entry to all the knobs, switches, AC vents, inside door handles, garnish around the gear knob, instrument gauges with digital multi-information display which displays what gear are you driving in even in auto mode. All in all, the interiors of the Mini are very impressive and pleasing. I give it a thumbs up. Mini cars are well known for their go kart like handling performance. The Mini Cooper convertible I drove had an automatic transmission which does take away some of the control from the driver, but you simply need to push the gear lever to the left while its in D mode and it come to manual mode and you can have fun with the Mini. The acceleration was not something which will sweep you away, but it was very impressive. The handling is an absolute pleasure with very precise control, well weighted steering, ample road feedback on steering wheel and confidence inspiring feel. The suspension is tuned in a very well balanced way for sporty handling and comfortable ride. We did not take it on bad roads, but on normal Delhi roads and speed breakers, the Mini Cooper convertible did pretty well. I had a pleasurable experience driving a Mini, if you are planning to get one, go and get behind the wheel for a test drive to make up your mind, it does make one of the strong value for money considering there are hardly any decent convertible cars with such sporty appeal in the price segment of under Rs. 40 Lakhs which is why it is the most in-demand Mini car in India as per the initial bookings. We will bring you more such test drive reviews, stay tuned.